This is a clear, streamlined guide to using Mindfulness-integrated Cognitive Behavior Therapy (MiCBT) to improve well-being and manage a range of personal and interpersonal difficulties. 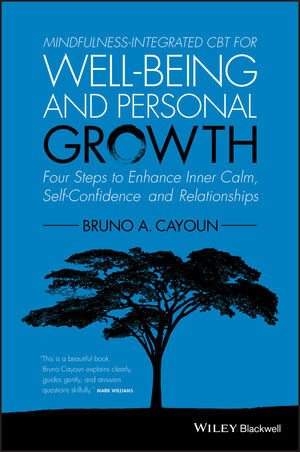 DR BRUNO CAYOUN is Director of the MiCBT Institute and a clinical psychologist in private practice in Hobart, Australia. He is the principal developer of Mindfulness-integrated Cognitive Behavior Therapy (MiCBT) and has been teaching this approach to mental health professionals internationally since 2003. He has practiced mindfulness meditation for over 25 years and has undergone extensive training in France, Nepal, India, and Australia. Dr Cayoun supervises mindfulness research at the MiCBT Institute and in collaboration with several universities in Australia. He is the author of Mindfulness-integrated CBT: Principles and Practice (Wiley Blackwell, 2011), as well a range of MiCBT resources for professionals.